Elon Musk has finally revealed the literal rocks he wants to sell people. 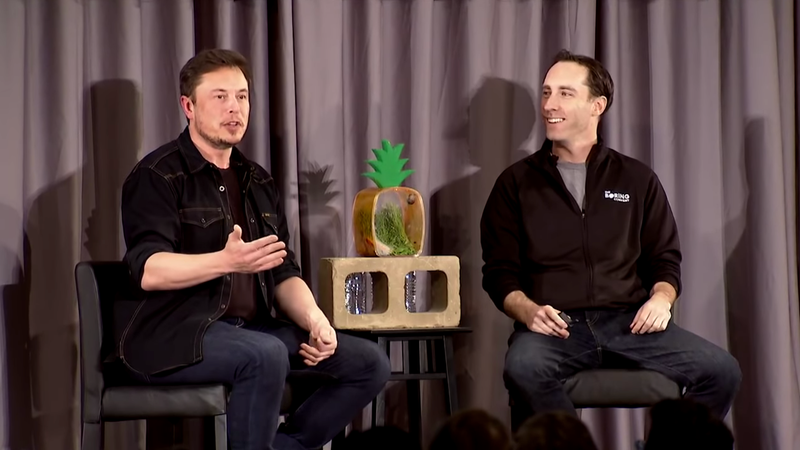 On Thursday night Elon Musk’s tunnel-digging endeavor The Boring Company livestreamed a company event on YouTube, in which Musk discussed plans for the hole it’s burrowing under Los Angeles. In the presentation Musk said the tunnel will be used for a 150-mph “Loop” transit system that will take riders in 16-passenger pods from downtown to LAX—an 11 mile trip—in 8 minutes. And he claims it will only cost $1 per ride. These are bricks that are made by compressing the dirt at extremely high pressures, adding a little bit of, a small amount of concrete. And we have bricks that are rated for California seismic loads. And then these bricks, we can sell the bricks for like 10 cents a brick or something like that. And they’re really great bricks. You can like build houses with them and things. These are like way better than cinder block. Because cinder blocks are not really that strong and kind of rough and grainy. These are super strong. They’re more like, like they’re smooth. They’re incredibly smooth. There’s not really a good analog for these, ‘cause these are bricks that are way better than any bricks I’ve ever seen at a construction site. As Musk mentioned a couple months ago in tweets, he wants to sell the bricks as large LEGO-like kits so customers can use them to build monuments. “I think you’re starting with the Egyptian pantheon,” Musk said at the presentation, addressing Steven Davis, SpaceX engineer and project lead at The Boring Company. “You told us to build a pyramid. We’re building a pyramid and a temple for you,” Davis responded.